This year we decided to do something a little different with our tree and I created this Christmas tree mobile consisting of ornaments suspended on clear threads. When I was shopping for ornaments to use found a lot on sale and went a little crazy. I decided it would be worth it to see how three different options would look. I did a variety of silver ornaments that came as a boxed set, green ornaments with three different textures and three sizes of clear glass ornaments that look a bit like bubbles. Here is the mobile in context of our dining room (please forgive the mid-present wrapping clutter). We have room to put presents below it, and are still able to peek out the windows to see if the neighbor’s cat is visiting our front porch. The ornaments are hung on regular ornament hooks attached to jewelry monofilament secured with crimp beads. I’ll put up details of how the mobile was created tomorrow. Instructions on how I made it are right over here. Absolutely stunning! I love the green one. If that’s your “mid-wrapping clutter”, we have another reason to be in awe of your awesomeness. What a beautiful, elegant twist on the hanging ornament craze. love love love this! Can’t wait for the how to — I’m curious about what the top spacer thing is. Thanks for sharing this. It pleases me to no end. We may just have to use this bit of inspiration in our home next year. Thanks again. what do you mean you are “not martha!” i beg to differ! this is so clever and beautiful! unfortunately it would be a huge tangled Christmas mess in our house with a 2 yo and a large dog! but i LOVE IT! the “bubbles” are so gorgeous! This is stunning! My infant would love love love to have something like this above his crib! Gorgeous! This is the perfect way to fit a tree into a small or minimalist space. And the clear ornaments could be rearranged to look like champagne bubbles for New Year’s. That is too cool! I love it. I agree with Constance about the lack of mess in your space. I’m very much in awe of both the trees and the tidyness. Mega! What a GREAT IDEA!!!!! And I have several color wheels from the 60’s that I used with my aluminum tree that would make this so cool….. I do not have room for a table tree in my front window, but I do have room for a ‘flat’ version of this in front of the window. And then with the color wheel!!! I am HYPED for Christmas 2011!!!! Now this is what I’ve been waiting to do! I definitely will be stocking up on clearance ornaments. It looks delightfully cat proof! This is amazing looking, and perfect for small apartment/condo dwellers. If we didn’t already have our artificial (watch the cat and dog try to eat both plastic and wood) tree up, I would definitely be trying this! Very trick…what type of frame did you use to secure the filaments at the top? Wow that’s really awesome looking! What a neat idea. LOVE this! Please, please post how you did it! Thanks everybody! I’m so happy to know you like it. I wish I had a way to get pictures in front of a blank wall, I find the curtains distracting in the photos but the tree is more of a focus in real life. Shawn – I’ll be posing a complete how-to tomorrow. The frame is pretty neat. Constance and Patricia – In my defense we’d mostly cleared stuff away and the dining table was pushed back to get a photo, it’s usually a bit tighter in there. holy crap, this looks so cool!!! Wonderful idea, gorgeous effect! Looking forward to the “how to” post. Thanks! Wow. This is is stunning, really. I don’t know if I’d have the patience to work on this craft, but I just wanted to say that is pretty awesome! What a great idea! My sister is moving into a small apartment while out of state for some training, and was lamenting her lack of space for a real tree. I’ll be sharing this as a lovely, clever solution! You are brilliant! I love this! It looks beautiful. I’m eager to know how you created it. I tried to buy a Christmas tree this weekend and failed. I love the three variations. Gorgeous. Great idea. How do you plan on storing it without creating a large tangled mess? I was set on creating something like this but I couldn’t figure out an attractive way to secure the filament to a frame or support system. Plus the popcorn ceilings at my place make these kind of hangings alarmingly unstable. I’m looking forward to see your “how-to” tomorrow! Absolutely ingenious!!! How do keep innovating like this? LOVE! I’m allergic to real trees and live in a small space so I’m reluctant to invest in a fake tree only to have to store it for 11 months a year…. This may be just the answer. 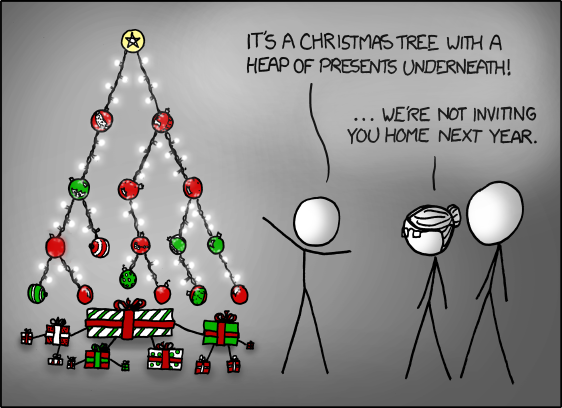 This is the most clever interpretation of a christmas tree I’ve seen yet!!! Love it a LOT! Just gorgeous, especially the silver version. Sadly, I can only imagine what my cat would do to this, and to herself, within minutes of seeing it. To her eyes, this would look like about a hundred cat toys all hung just for her to tangle. very very cool!!! I love it! Fabulous idea! It’s just gorgeous. Especially loving that shot from below … I could daydream there for hours! that’s the most creative Christmas art I have ever seen! I’m speechless I LOVE it more than anything! That is brilliant, and oh so pretty! That is a really cool idea and it look’s good all set up. Will have to wait here until next to try it though, maybe use some multi-colored ornaments. Truly breathtaking! I adore the shot from underneath. Wow! This is brilliant, and I LOVE the photo of the ornaments from below – would be stunning framed. That is so cool~! I love it! Oh, if only you’d posted this last week, before I sprung for an ugly cheap fake tree to fit in our 5 foot window seat space! Thank you so so much for all the comments, I’m thrilled! The how-to post is all ready and will be posted tomorrow morning. Making the mobile was easier than I thought. Wow, this is unbelievably cool! This is great for my small space. our family friend used to float her tree in the air. they had a outcove in the ceiling and they would hang the tree (no idea on how they watered it) and it was so magical and light. this is just like that! I would LOVE a high res version of the view from beneath the green mobile. That photo just screams desktop background for me! WOW, I LOVE love love this!! Did I mention I love it? Wow, that is super awesome! Oh my heck, that has got to be the coolest thing I have ever seen!! I’m seriously so in love right now. MUCH cooler than a Christmas tree. Completely blown away! So stunning. MY WORD, that is absolutely gorgeous! I cannot wait to see how it is attached to the ceiling! I hope you don’t mind but I am posting this and links back to your blog, along with the images on my post. I REALLY REALLY LOVE IT. It’s so minimalist!!!! Mathematically, not a true tree, but pretty, nethertheless. a lovely blog with wonderful ideas!! This is genious! Elegant, simple, artistic, eco-friendly, clean and with an amazing WOW factor. The green shows up the most against the while background but I am intrigued by the mixed texture silver ornaments and the clear ones really DO look like bubbles. Thanks for sharing! I see you decided on the green one. I rather like the first one, the silver one. Very versatile idea. No watering and easy to clean under. Also easy to see through since it is in front of a window. Love it! Last year, we were in Paris for Christmas, and Sonia Rykiel had ornaments hanging in the windows. The display was just fabulous—and yours is reminiscent of that window. I might even like yours more! I love this idea! Great! You are a creative genius!!! I absolutely LOVE this!!!! Very neat but would not stand up to my toddler at home. that is insanely brilliant!! also one of the most beautiful things i’ve seen in a long time! and i could do it too!! i can’t wait until the after christmas sales for new christmas blubs! Just fabulous….fit in any decour and enhance the holiday theme. Thank You. Super cool. But I’m dying to know how you are going to store it. Love this! If I don’t make it too long (or if I use shatter-proof ornaments) I will have a cat-proof Christmas tree next year! Yay! What a great idea! I love the look of this and am going to try this for next Christmas. Would look great in a bay window! I JUST found this! I absolutely LOVE it! What a great idea!!!! I love this a little bit too much. Never in a million years would I be able to pull it off, but if there were a manufactured item I’d surely have one. What a cute idea….really original idea. I would so do this if I didn’t have a cat!! I am scared of the disaster she might cause. How chic and modern. Love the green bulbs. Your very talented. Thanks for sharing. I ABSOLUTELY LOVE THIS!!! I saw a comercial of this on TV and have been looking for this for a while. This is the only site that I found this on. Not to mension this is a great space saver. Thanks for sharing! I knew I had seen this idea before (http://www.crateandbarrel.com/holidays/christmas-decorating/ornament-photo-chandelier/s254579), but I really like your take on it. The guy down at Encore was fantastic helping me find the rack. Had to go with a 14 3/4 instead of 17 3/4 because they were out. Made a few adjustments to the measurements and I think it turned out great! I would love to do a bigger one next year. Carina – A commercial on tv? Where? When? Tell me more! Eve – I don’t mean to sound like I’m bragging but I did my ornament mobile last year, and the C&B hanger you link to came out this year :) It is a good one though if you want something about the size of a chandelier. I think it also packs flat (something we need since we don’t have much storage space in our house). I decided to make this for our Christmas tree this year. It took some scrambling, but I found the steamer rack at Creseto Restaurant Supply in Sacramento, and the mini-lanyard clips at Michael’s in the jewelry/bead department. I can’t believe how hard it was to locate those two items! I hope this helps others. The tree I ‘m doing will have the angel planted on top of the steamer rack. I already spray painted the rack forest green, and will cover it with greenery, to surround the angel. I vaguely thought about painting it a soft white and using white quilt batting/Xmas tree batting to be a cloud for the angel to stand upon. So, who knows how this will turn out. I have a traditional house, so the modern/industrial look of all of the silvery metal does not work. So, I decided to decorate up the steamer rack . Someone might want to put a nativity there, a flameless candle, or something else. I decided I am going to cover the chain with an ethereal shiny fabric, sewn in a loose folded tube over the chain. I have no idea how this will look, but at least my husband and I will not be sneezing our way through the holiday season this year! Thanks so much for all the advice and variations everybody is sending in, I appreciate it! Have you seen the HOME DEPOT add? They have one of these trees hanging over the dining room table. I had to rewind the TV and show it off to my Husband who should have been named THOMAS because when I sent him this link, he doubted it would look good over the dining table!!!! HA! Barron – I love it! This is gorgeous! So unique! Stop by and link up if you have time! I created this last weekend. thank you for the inspiration & instructions! Amanda – Looks super fantastic! I’ll hype this in the Netherlands! I really love this, I tried it, worked on it for days.I finally gave up.It got 2 confusing,was hard 2 work with the monofiloment because it was hard 2 see.Wish I could of finished it. It is beautiful when som.somebody else does it. We just finished this for our lab/office. We love it – thanks for the directions! We used a plastic gridded air filter support instead of a metal rack and had to add some support to get it to hang right. Definitely will go with the steamer rack next time. It is definitely easier if you can work with someone else. I can see modifying this for a DNA model. i had the same idea to make a a christmas tree mobile, i started making a frame for it but it just wasn’t working so i googled “christmas tree mobile” and up came your blog! thank you for posting your great instructions! i made my tree, it looks so AWESOME! i love it! tips to folks that are planning to make it: don’t cut and loop all your lines and leave them stacked on top of each other. i did this and all of my strings got so tangled, i couldn’t take them apart!! it really sucked. so then i decided to prep my rack, then cut, loop, hang on the rack with the ornament to weigh it down. my only concern now is packing this up after the holidays. how do i keep the string from tangling? thanks again!!!! love it so much! Hoe your Christmas was wonderful ! I made the floating ornament xmas tree and would like to email a few pics to you! Thanks again for taking the time to publish the instructions. I hung it over my dining room table because we have 15 ft ceilings! It took 4 of us 6 hours to build and it’s about 5 feet long with 100 ornaments. I love it! Wow!! what a great idea..looks really classy…!! I love how they look like holograms. Can’t decide if I like the green or silver better. I may never have the patience to do this, but thanks for posting it. Happy New Year. I look forward to seeing what you do next! Everyone’s is beautiful! I want to try too–maybe after a post-Xmas Sale for the balls?! My question is HOW do you store so you can rehang quickly from storage??? They really do give the sense of floating in the air – you can see the strings in the close up photographs, but from a distance they just look suspend. Wonderful! This is amazing looking, and perfect for small apartment/condo dwellers. This is such a uniquely beautiful twist on the traditional Christmas tree. My home is small (Fla. bungalow) this is perfect! May God bless your talent and you! Zina – That would look really tidy but it would be a hassel if you want to rearrange the bulbs to get a few colors/textures spread out nicely. It would work for the clear bulbs really well! Love this idea! I’ve shared on my blog. Thank you! Cuantas esferas se usaron para hacerlo..? me encanto la ideal..!! I love this idea, as I am looking for a way to replace the fake tree and do not want to kill a real one for just one month of enjoyment. I don’t think this will work for us though. Our ornaments are not uniform and we cannot afford to replace most of them for this project. Also, I really miss the lights! Thanks so much for the inspiration and detailed instructions. We were very pleased with how ours turned out! I am thrilled for this project! I bought gold ornaments and have everything else ready! except for the steamer, I can’t find one! help! I absolutely love this! One question, how do you store this? Annie – At the bottom of this post I have an update with a photo that shows how I store it, it’s very compact. Perhaps it was mentioned somewhere in the tons of comments…but where is the best place to buy ornaments in bulk?? J – I cannot give you a comprehensive answer, but the other day I saw packs of 100 ornaments in Target for $30. From what I recall that is a better price than any of the sets I show here.